We arrived late. And in the race up to the night festival and back, we left with little or no impression of this historic market town, in the heart of the larger Takayama city. 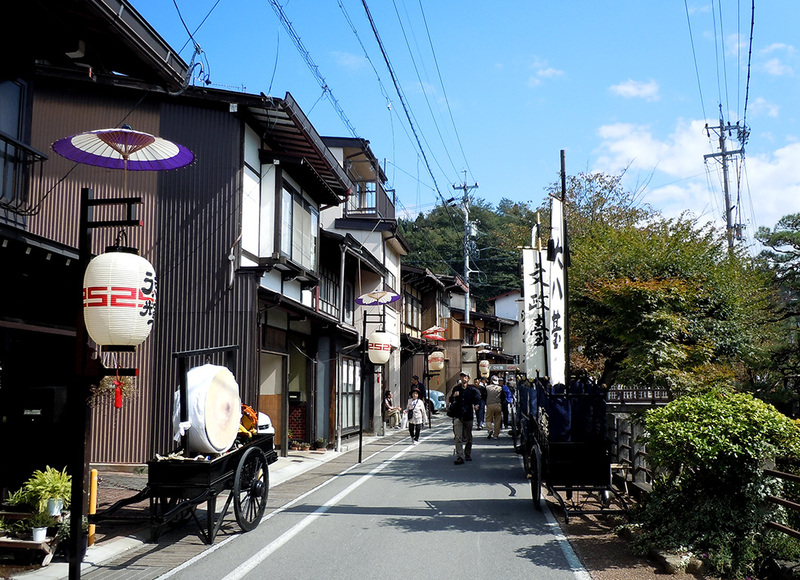 On our return the next morning, after a night at an Onsen nearby, its medieval charm and picturesque setting, took us completely by surprise! Sakurayama Hachimangu Shrine. 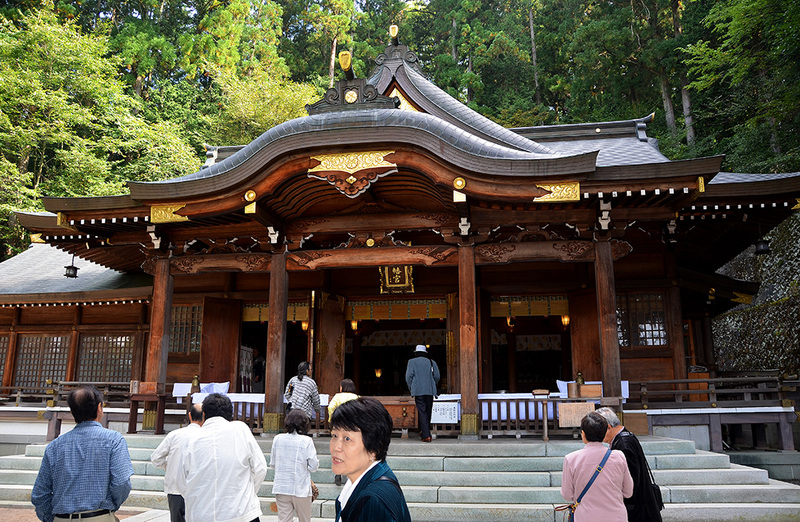 Dating back to the 4th century, this shrine was enlarged in 1683. 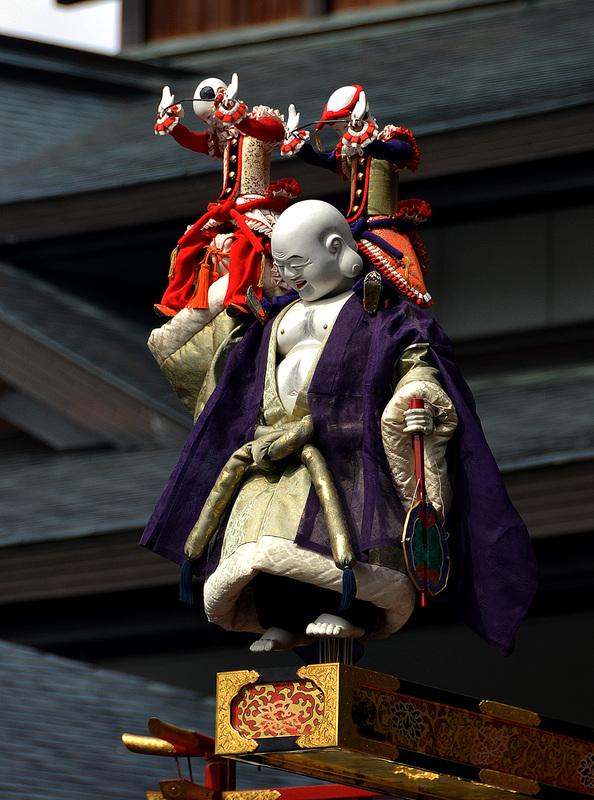 Presiding over the centre from a considerable height, was the 4th century Sakurayama Hachimangu shrine. And parked on the main street down below, were the 10 Yatai, looking none the worse for last evening’s exertions. 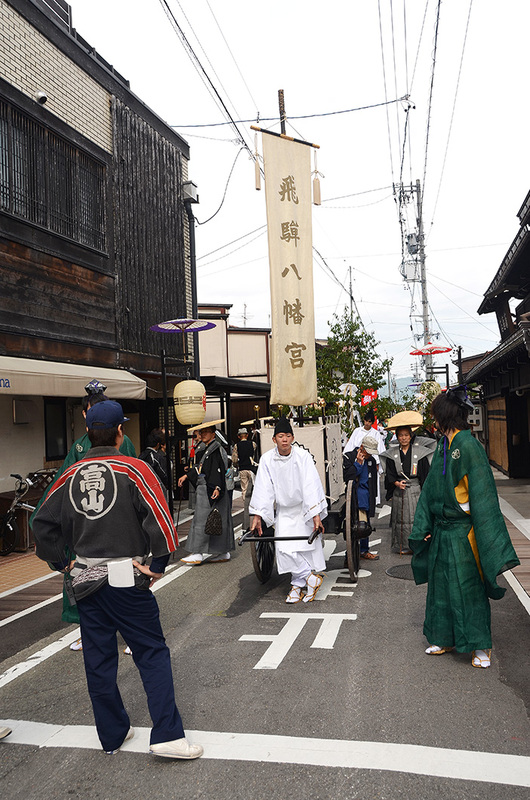 Long narrow streets crisscrossed the town, interspersed with bridges and numerous smaller shrines and traditional timber homes. 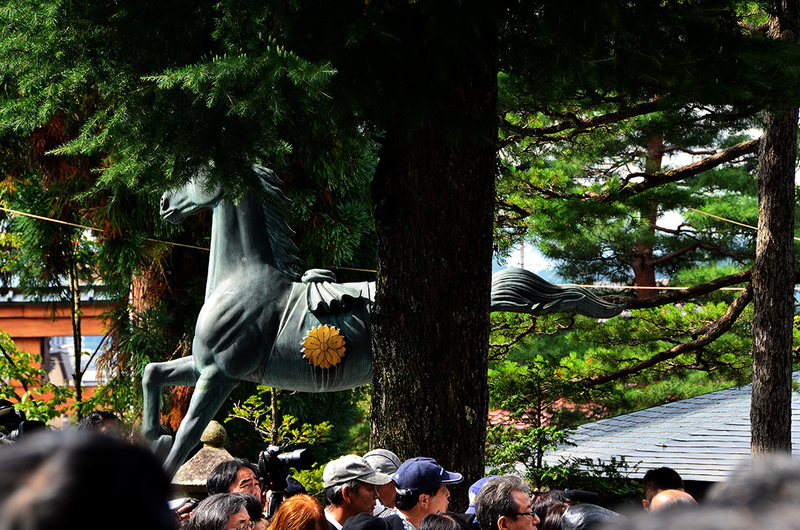 Although over run by local tourists, here to witness the Matsuri, the photo ops were endless. And not surprisingly, I got separated from my group a number of times. They seemed to just vanish into thin air every time I stopped to peer into my view finder! Endearing flautists entertaining the crowds! 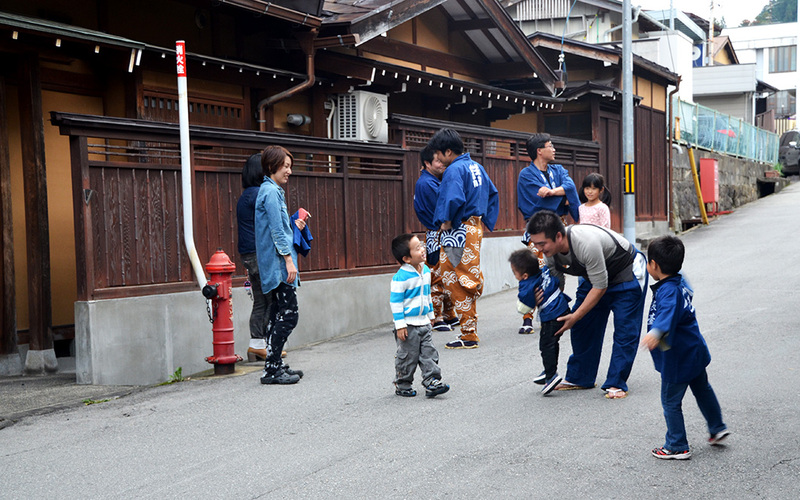 The Yatai Gumi and their families, awaiting the return of their Yatai. 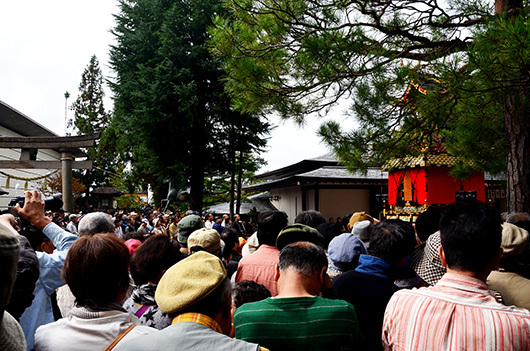 Around midday the crowd surged forward towards the shrine and I followed in its wake, certain that my sister and friends, without the distractions of gathering blog fodder, were already up there. 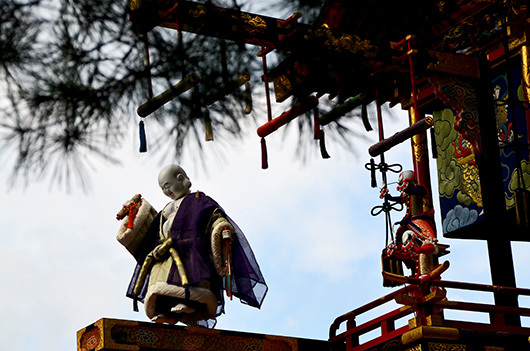 Tucked into a corner of the packed quadrangle, was the eleventh Yatai – the Hoteitai – that was to be the stage for the Karakuri Ningyo, a mechanical marionette performance, dedicated to the Kami or residing deity of the shrine. We learnt that the wooden marionettes are attached to 36 invisible strings which pass along a trough in the projecting arm. These are connected to push rods inside the float that are manipulated by nine skilled puppet masters. Hoteitai and the two ‘child’ dolls on his shoulder. Note the fine details on garments, the little doll’s gold brocade slippers and the chest hair!! Like all temple related puppet and dance shows across Asia, this story is replayed year after year, and to the same reverent attention and applause! Took me back to the mesmerising Yakshagana and Bhoothakola performances of my childhood and the oft repeated myth and folklore passed down through uncounted generations. While the skill of the Karakuri puppeteers was thrilling to witness, a little known fact about the puppets, that I unearthed after my return, tainted my memory of the event. The springs that ensure the smooth, lifelike movements of their limbs I discovered, are made from the baleen of critically endangered Right Whales, as they have traditionally been since the Edo period. No metal or plastic substitutes can reproduce the same fluidity of movement, nor can one made from any other whale baleen! I am a great fan of the Japanese passion for perfection. But in this instance, the less subtle movements of the Karakuri Ningyo would be a very minor compromise. Very interesting article, Madhu, with colorful photos. Like you I would choose for less subtle movements, if that meant whales would be left free. I so agree with you, Marion. Subtle movements are no excuse for cruelty. No they are not Debra. And I refuse to believe that such a refined country cannot see that. I am not very well informed about anti whaling issues, but there has to be more to it than meets the eye. As always,splendid!I think I learn more about geography and cultures then I could ever hope to in school textbooks! What an interesting experience. But like many cultures, Japan’s will have to move with modern times as we strive to save our whale population. Our colture is “modern” but this modernity has an awful price to pay! And there are many exemples Colline, but the trouble for human being is always to stare at other “so called” mistakes without looking into the mirror of our own soul! Whaling is a sticky issue, and I did debate including it, but those are the facts and it did make me feel bad. With 50 of one species and a few hundred of another left, an alternative would have to be found sometime or another! Why not now? That’s pretty bad about the whales, do they take the baleen when the whales are alive? No from what I have read it is removed from dead whales. And I don’t think any whales are being killed specifically for the balleen either. Loved your post Madhu. I always feel like your photos come alive while I am reading your words. I was saddened to hear that they continue to use the baleen of such an endangered animal…very tragic. Yes, ruins the joy of this experience a bit. Thank you for your kind words LuAnn. Does dampen the enthusiasm a bit doesn’t it? But remember, despite the weak argument in that article, that whales are not being killed explicitly for the baleen. I’m so glad you stopped to take all these pictures, even if you did lose your companions in the process. They’re beautiful, and so exotic! And I am so glad you enjoyed them. 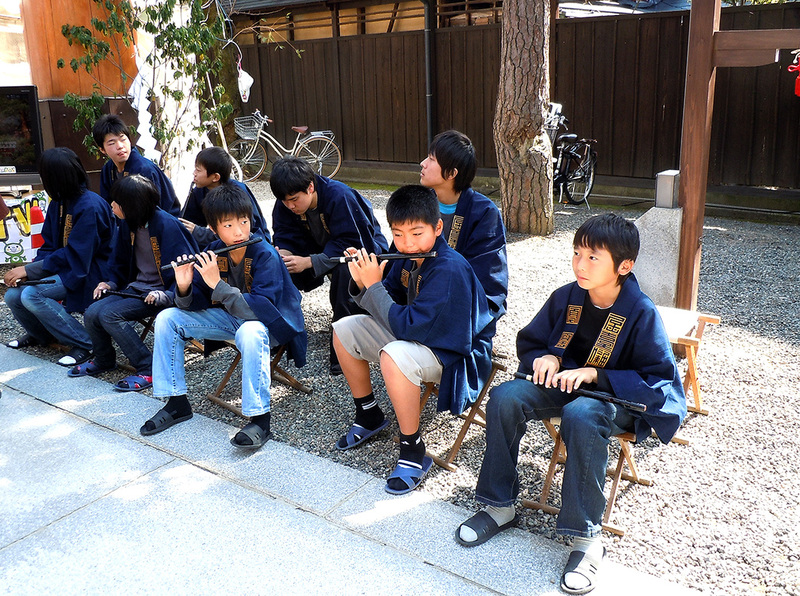 Stunning photos .. my favorite is Hoteitai – the close up – with the children dolls. A very interesting and well written post .. thanks for taking me there. Never seen anything like -the Yatai’s are so beautiful. 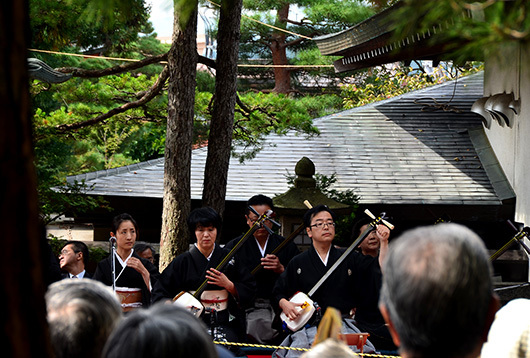 Japan is filled to the rim of beauty and tradition. 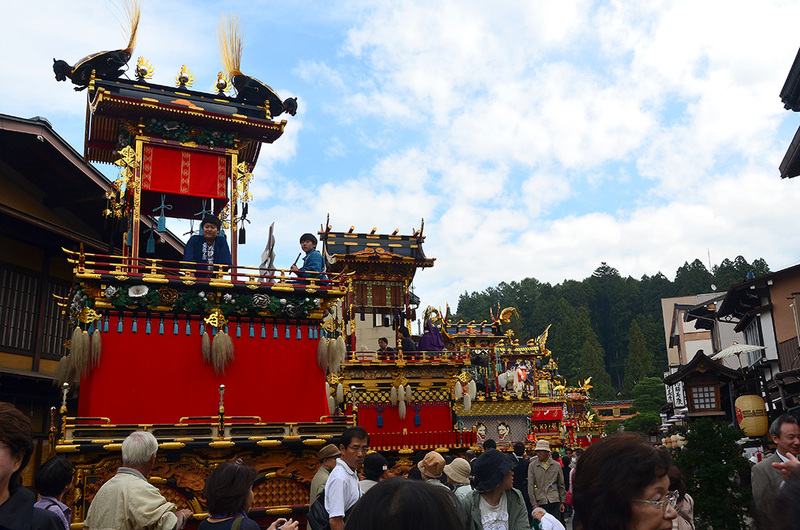 Amazing those Yatai – and they must be very heavy to carry too. Thanks for taking me .. with you. Such a different world from where I live in. I appreciate able to experience what you have seen. Thank you so much for sharing and lovely photos. I couldn’t agree more re your last sentence. It’s difficult to believe such a shallow reason gets priority over the protection of endangered species. How can we be so selfish? Love puppets though. Have a couple of really good friends who are puppeteers and organise every year a very good puppet festival in Spain. I wish I could go one day. 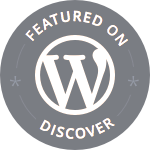 Keep the great blogging up! All people, even great people, have blind spots. Whaling seems to fall in a blind spot of this great people. This is fascinating, Madhu! I don’t know if you knew I was a professional puppeteer in a former life, but I loved reading about this and seeing your photos. Through your pictures and writing, you take us along on a remarkable journey! Excellent photos. Do you happen to know the name or significance of the structure in your very first shot? I’ve seen it a number of times and really love the way it looks. So many insightful comments on whaling above…such a conflicted topic. I think your readers are amazingly thoughtful. Love all the photos Madhu. What a phenomenal place! That was really informative. Learned so much in a very interesting way. I felt the same way when I watched the bullfight in Madrid – although there were aspects of beauty and art (in the costumes and the “dance” between the bull and bullfighter), I was horrified by the graphic cruelty on display. Traditions seem to be very hard to dislodge in this part of Asia… the appetite for “exotic” delicacies like shark’s fin is still voracious here in Hong Kong. I am hoping to see an eventual ban on the trade but that seems to be wishful thinking for now. 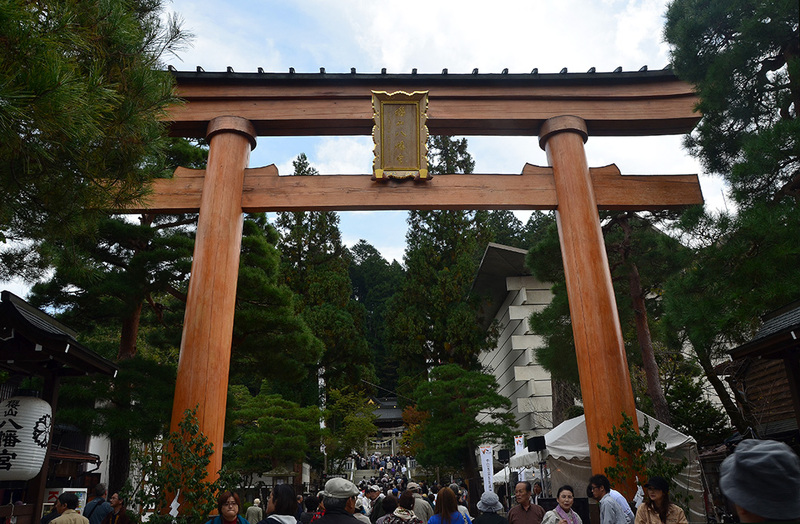 From the perfection of a typical Japanese ‘gate temple’ to controversy in the course of one morning – oh what a wonderful world! For fear of overtaking your post, I’ll not weigh in except to say I’m glad you raised the issue of the baleen. The marionettes are exquisite in their detail – perfect miniature moving sculptures. I’ve always loved the use of puppets and other surrogates to tell tales and fables (well, perhaps I was always a bit leary of bullying Punch!). Free the whales!!! Where do I sign? Wow, the streets in Japan seem to be really tidy and clean. I love all the pictures, but that just sprung out at me. I also refuse to believe that modern science is unable to reproduce balleen in the lab, I mean they are able to clone organs and let muscle tissue grow in petri dishes, for god’s sake. I mean of course they could just develop an artificial spring with the same elasticity for sure, but if they insist on balleen… Especially in Japan, the land of humanoid robots, insisting on such traditions seems unfeasable. Thanks for sharing your passion. They are beautiful. The crisp, colorful details of each picture and its description got me so excited. Like how it feels when watching an amazing show. Oh dear, the price of beauty and the reality of what goes into it . . . The hectic pace and excitement of the spectacle come through your words and pictures so well! Amazing place and great pictures but I loved the ones of the kids best of all! I can feel the culture through your photos, Madhu! It takes me straight back to our visits years ago! 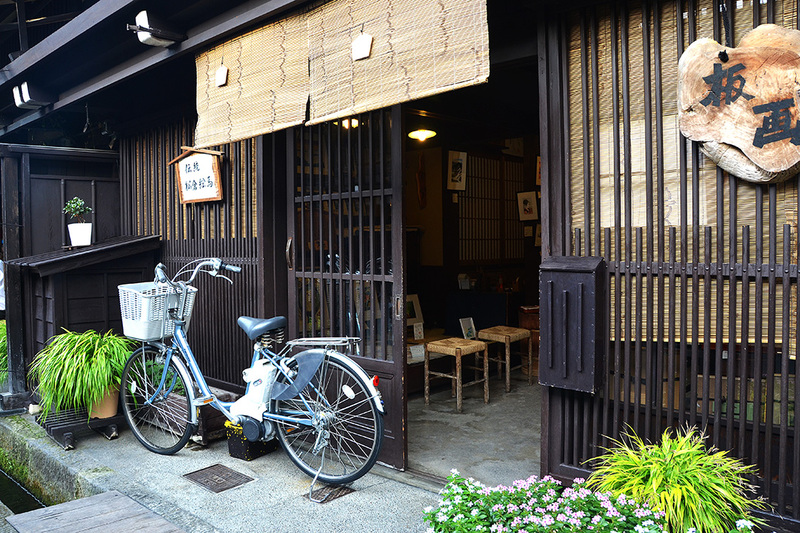 Never chanced upon Tacayama – but it looks like such a stunning and festive sanctuary! Oh no, at first I was going to write how beautiful they are and then I read about the baleen and that ruined it for me. Such a pity. I know traditions are important, but so is the planet and all of its inhabitants. Love the pictures, Madhu. 🙂 Japan (especially its rural areas) is in my want-to-see list and your account of your travel is such a pleasure to read. I am glad too that you chose not to gloss over the hidden environmental issue in the hoteitai tradition. Like your other readers, I hope that the use of balleens will soon go the way of dinosaurs. Madhu, I’ve unfortunately been too busy lately to have forays into the blogosphere, but I’ve now been enjoying your posts from Japan. How long were you there?